A personal take on the two bizarre years NBC journalist Katy Tur spent covering the Donald Trump campaign, during which time she was frequently singled out by Trump in his attacks on the media. 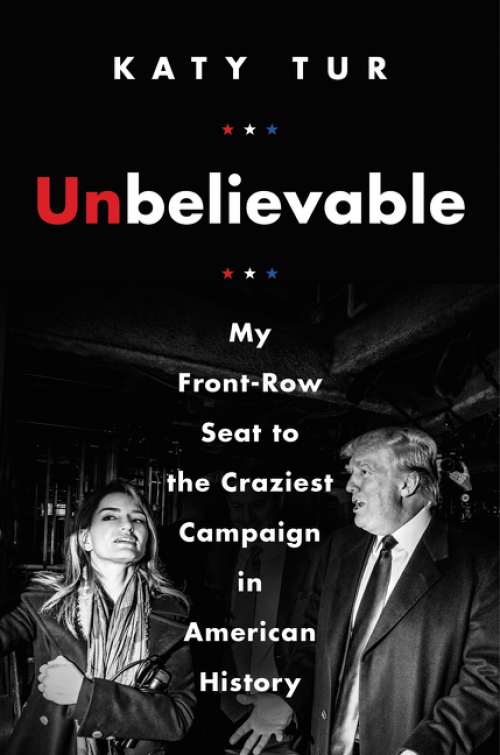 Unbelievable is an insightful page-turner of the most un-presidential president ever and his campaign for the White House. Tur proves to be as good a writer as she is a political reporter. Her writing is sharp, her sentences short and crisp, her humor, through it all, intact ... With Unbelievable, Tur offers a perceptive, entertaining and, yes, disturbing ringside account of history, both for today and for posterity's sake. By the end of Unbelievable it’s clear how wrong they all were in thinking they could run over 'Little Katy' ... Unbelievable offers a vivid sense of how threatening Trump’s personal insults can feel ... The more personal story Tur tells in Unbelievable is also compelling. Her parents were daredevil journalists in Los Angeles, hanging out of helicopters, sometimes with their daughter in tow ... Unlike two other recent books about the 2016 election, Shattered, by Jonathan Allen and Amie Parnes, which focuses on the dysfunction of the Clinton campaign, and Devil’s Bargain, by Joshua Green, which dissects the relationship between Trump and his Svengali, Steve Bannon, Tur’s account has no juicy insider details. It doesn’t say anything new about Trump and appears to have been dashed off. I found the narrative hard to follow. The chronology is purposely jumbled, jumping back and forth from the frenzy of election night to the rest of the campaign and then weaving in short takes from Tur’s personal life. Navigating through the book can be confusing. But one subject that Tur richly examines is the outrageous sexism of Trump and many of his supporters ... Unbelievable does capture the competitiveness within network television. Tur recounts her understandable disappointment when she was cut out of coverage of an NBC presidential debate. It reads like it was written for her colleagues on the trail, full of insidery reminiscences, professional self-doubt, last-second flights, lousy hotels and gossip about which NBC News embed was making out in a garage with which CNN staffer. Yet what elevates Unbelievable beyond one more pedestrian campaign memoir is Tur’s skill at capturing the constant indignities of campaign reporting while female, including the worst indignity of all: enduring the fixation of Trump himself ... Tur’s imagery is occasionally overdone but she has a knack for breaking down characters and moments ... Tur is memorable on the contrivances and idiosyncrasies of television journalism ... Deep into the book, Tur recalls the advice of a longtime television journalist, who managed to remain professional on air no matter how angry or tired or sick he felt. 'No one cares,' he told her. 'The news is not about you.' Those words stayed with her, she writes. 'I can hear him in my head now, prodding me.' I hope she keeps listening. What did you think of Unbelievable?